The personal care that Dr. Newbill and his team give is something very rare these days. They really care about the animals they treat and go out of their way to take care of the ‘people’ too. The staff and doctors are phenomenal! Our long/wire-haired dachshund is quite a character and they welcome him by name whenever we go! Wow! Y’all are just awesome!!!!!! I made the right decision to switch vets. They truly love their patients and the clients. They have more compassion than any other veterinary practice I have been to. Your best pals are in the finest care at St. Bernard Veterinary Hospital. Nurturing animals is second nature here at our clinic. We invite you to explore the site & learn more about who we are, and how we operate. At SBV, your pets may as well be ours! We practice UNBELIEVABLY GREAT medicine. Here at St. Bernard Veterinary Hospital, your family comes first with a staff that cares. Thursday:	7:30am – 7:00pm *OPEN LATE! There will be times when your pets require hospitalization. St. Bernard Vet maintains a full service veterinary hospital and can provide many treatments as well as observation if necessary. 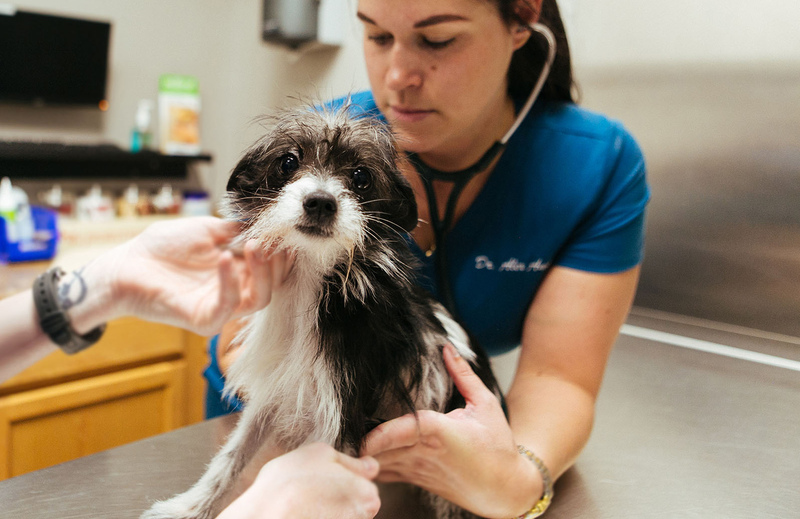 We may also refer you to our emergency clinic for the night (the Animal Emergency Clinic phone number is 504-835-8508) or to a specialist clinic for more intensive observation if your pet is extremely ill and requires intensive care. We want your pet to have the best care he or she requires and we are glad to make the necessary decisions during such a stressful time. It is extremely important to have your pet spayed (for females) or neutered (for males). Spaying and neutering your pets helps to control the extreme pet overpopulation problem, but it also prevents certain types of cancer and numerous behavioral problems. We recommend spaying or neutering your pet at 6 months of age, before puberty. This important surgical procedure should be discussed in detail with your Veterinarian. Please call St. Bernard Vet to discuss spaying or neutering your pet. St. Bernard Vet is happy to provide you with the latest technology in Digital X-Rays. After Katrina, St. Bernard Vet purchased a Digital X-Ray Machine. This was a tremendous upgrade from x-rays taken pre-Katrina. Pets are hard to x-ray as they don’t always want to stay still and tranquilizing can be difficult if a pet is sick or injured. In the old days taking and developing an x-ray could take between 20-30 minutes and you may have to redo the x-ray if the pet moved. With digital x-ray, this process has been reduced to 6 seconds! That saves a lot of time, but it also saves on the cost of the x-ray film. Digital x-rays images can also be easily sent to a specialist if needed. Vaccines are generally given annually to protect your pet from infectious disease. Dogs are vaccinated for Rabies, Distemper, Adenovirus I, Adenovirus II (Hepatitis), Parvovirus, Leptospirosis (2 strains), Parainfluenza, and Bordetella. Cats are vaccinated for Rabies, Feline Distemper, Rhinotracheitis, Chlamydia, and Feline Leukemia. At an annual examination, we also screen for any problems, such as different kinds of cancer that your pet may have developed in the last year. St. Bernard Vet maintains a Pharmacy at our hospital. While you may not think of your Veterinarian as a Pharmacist, we dispense many medications for your pets and in some cases, even write prescriptions (to be filled at human pharmacies!) Each day, Veterinary Medicine becomes more specialized and over time many human medications have come to be used for animals as well. Dental Care for your pet is an important part of their overall care. Not only can your pet’s bad breath drive you crazy, but the plaque and infection causing the bad breath can steal time from your pet’s overall life. At St. Bernard Vet, we can show you some methods of brushing or cleaning your pet’s teeth at home. We also recommend periodic dental cleanings (under anesthesia) at our hospital. These efforts are to avoid infection and disease like Periodontal disease which can spread into your pet’s body and cause major problems. Prevention is the key to good dental care. St. Bernard Vet provides both grooming for your pets. We presently have one full-time groomer and due to demand, grooms are available by appointment only. As we do try to accommodate everyone, several staff members have been learning to groom and bathe pets as well. We do our best to make our clients happy. Heartworm prevention is a major part of your dog’s health program. Heartworms are caused by mosquitoes and in our area this is a tremendous problem. Without some type of preventative, an outside dog in St. Bernard (as well as surrounding areas) will die of heartworms. Thankfully, prevention is easy. We recommend Heartworm Medication for all dogs. Heartworm Medication can be given monthly or every 6 months, depending on the type of Heartworm medication. It is important to discuss your options with your Veterinarian. Flea and Tick control, especially fleas, is a big topic in our area. Fleas are a nuisance to pets and to humans. Fleas can also severely aggravate any skin problems your pet already has. There are many products on the market, so many that it seems like there are new products every month. There are even commercials on television! The good news is that many of these products are very effective and you have choices. You can use a monthly oral product or a monthly topical product. It is important to discuss your options with your Veterinarian. St. Bernard Vet sells Hill’s Science Diet and Prescription Diet Foods. We believe in these foods and in Hill’s commitment to Veterinary Medicine. Hill’s Prescription Diets actually allow us to treat many health problems your pet may acquire. It is our hope that in feeding these very sophisticated diets to your pets that they will live longer, have less heath problems, and be healthy additions to your family.